Length about 13 mm. 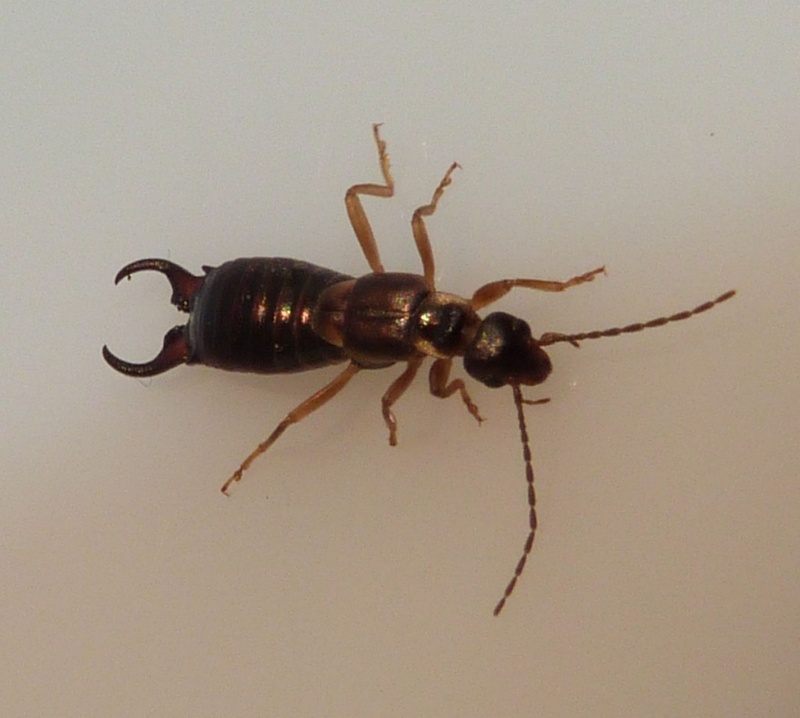 The Common European Earwig is reddish brown in colour, with a flattened and elongate body, and slender, beaded antennae. 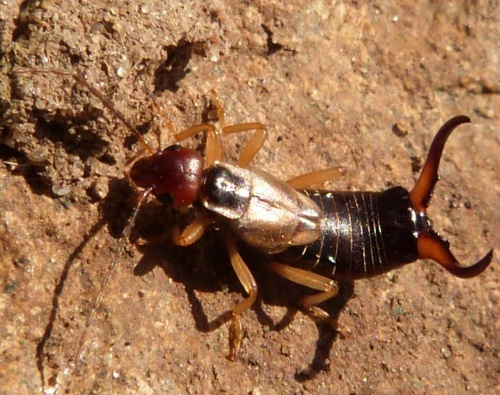 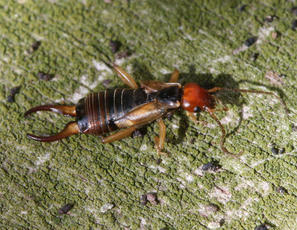 An obvious feature of earwigs is the pair of 'pincers' or forceps at the tip of the flexible abdomen. Both sexes have these pincers; in males they are large and strongly curved, whereas in females they are straight. 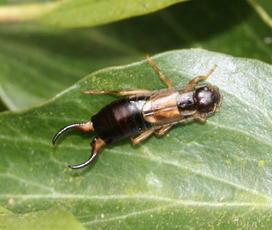 Larvae or 'nymphs' are similar to adults in appearance, but their wings are either absent or small. 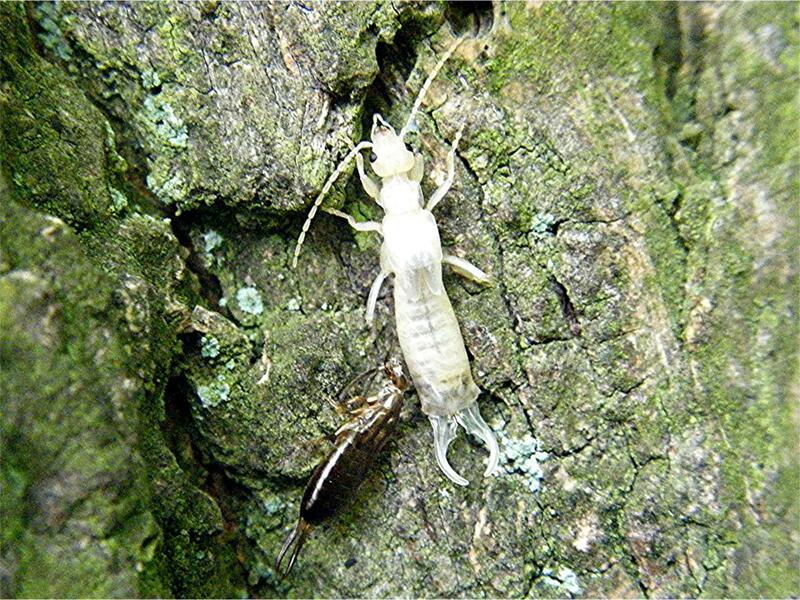 Found in a wide range of habitats and is common in gardens, often tucking itself into dark crevices on tree trunks and plants or other refuges such as log piles and stones. 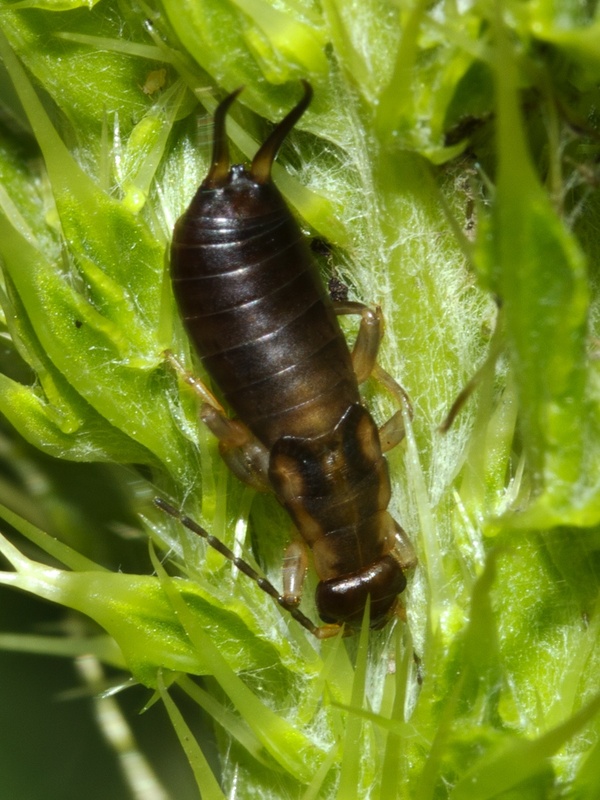 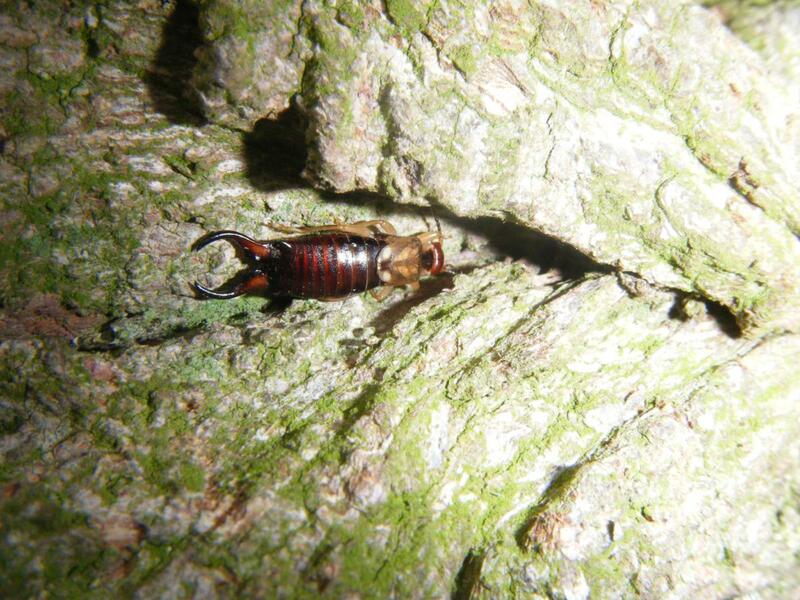 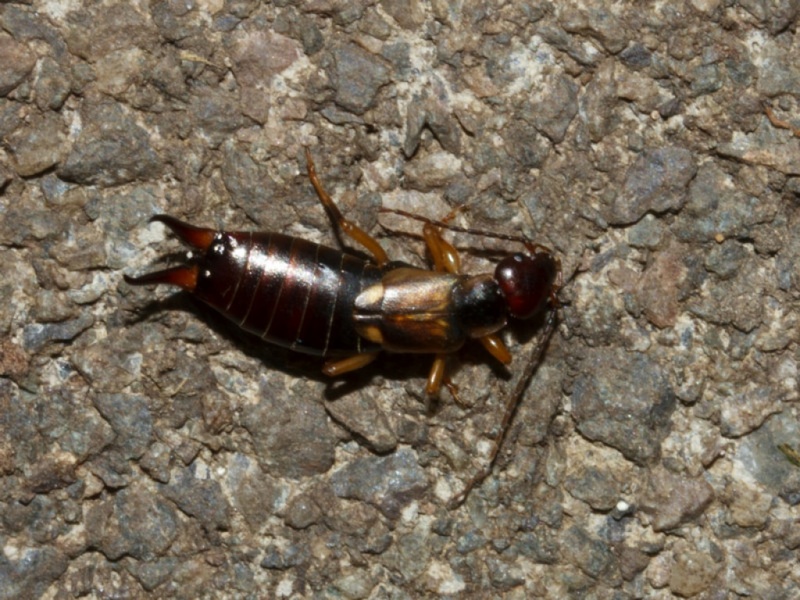 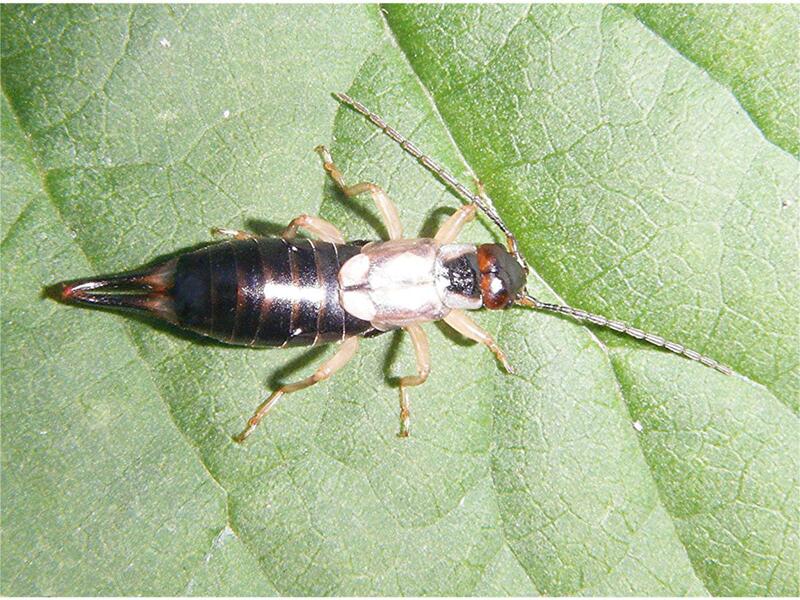 Earwigs are typically at their most active at night, when they emerge to feed on other insects, detritus, fruit and plant matter. 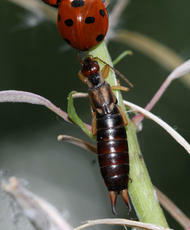 They fly very rarely, and can be pests, causing damage to flowers. 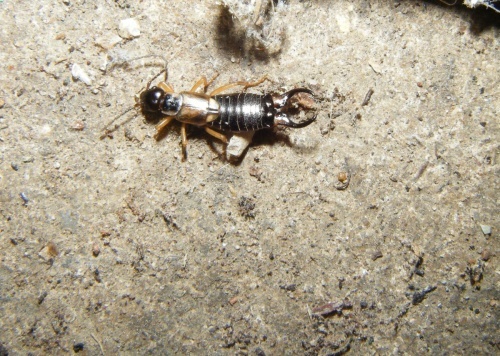 The earwig is a fascinating species, and is one of the few non-social insects to show dedicated parental care of offspring. After mating, the male departs and the female lays 50-90 white eggs in a nest the ground. 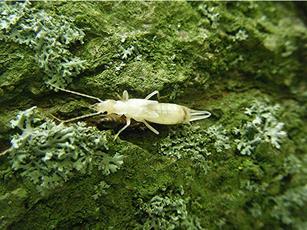 During the winter she defends the eggs against predators and keeps them free of mould by licking them. 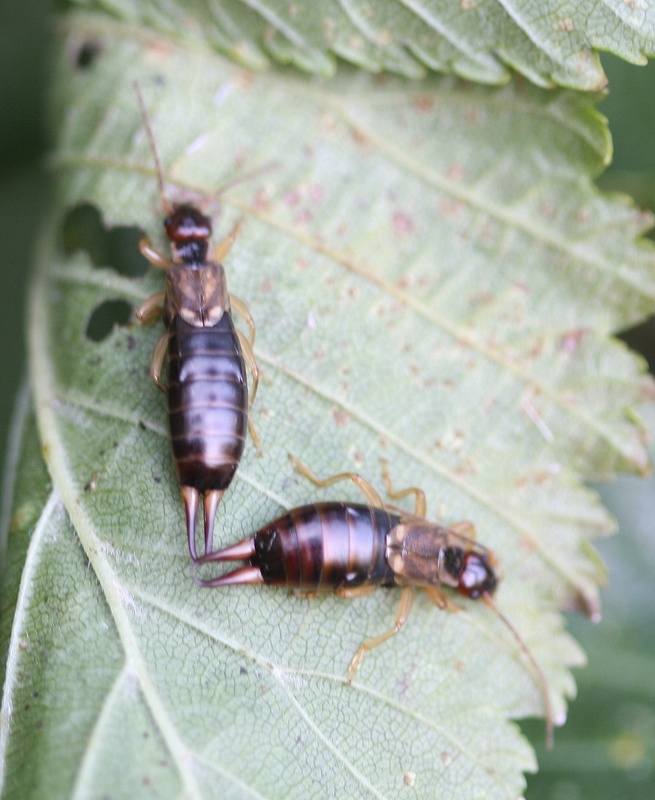 After the larvae (nymphs) hatch, the female cares for them during the early stages. 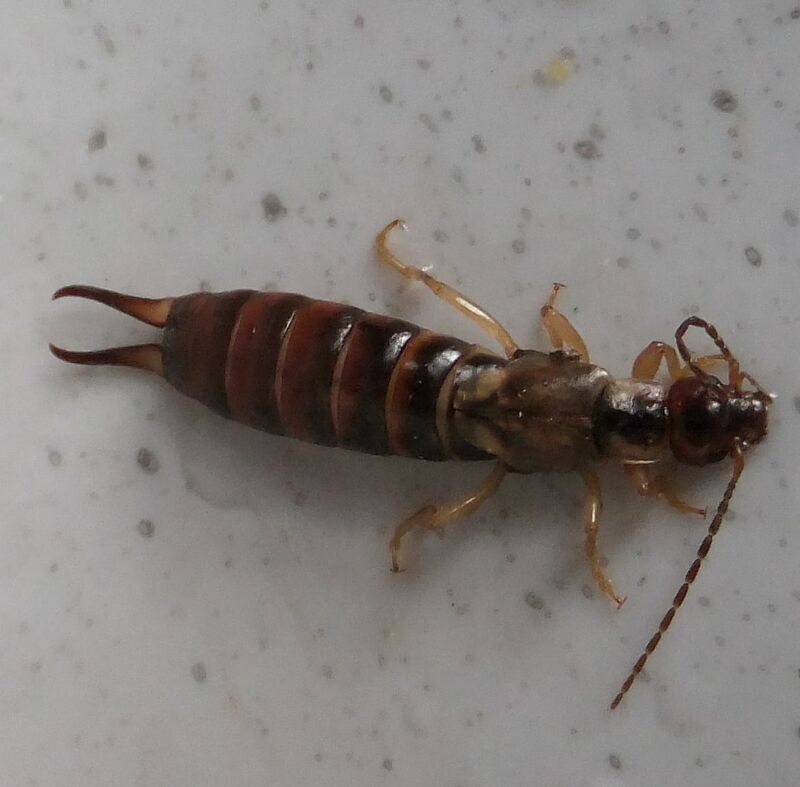 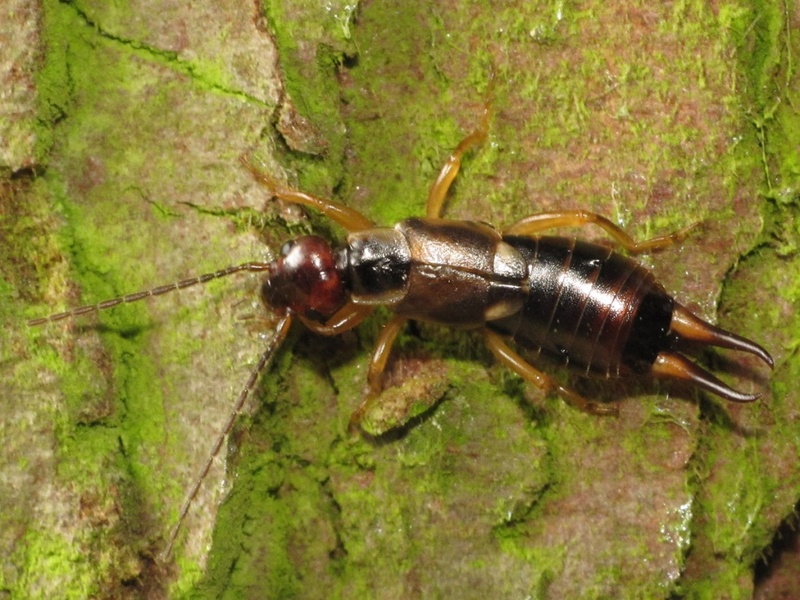 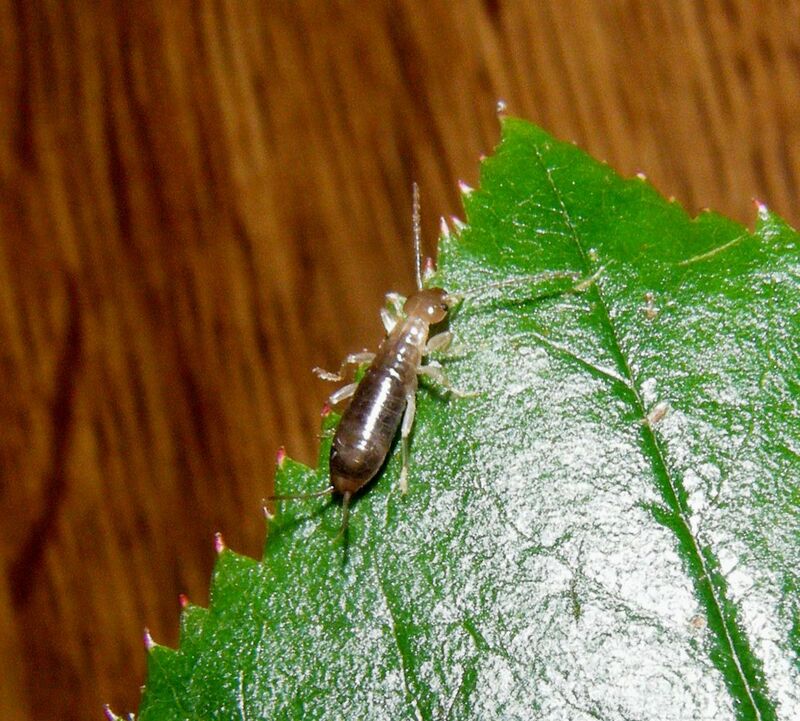 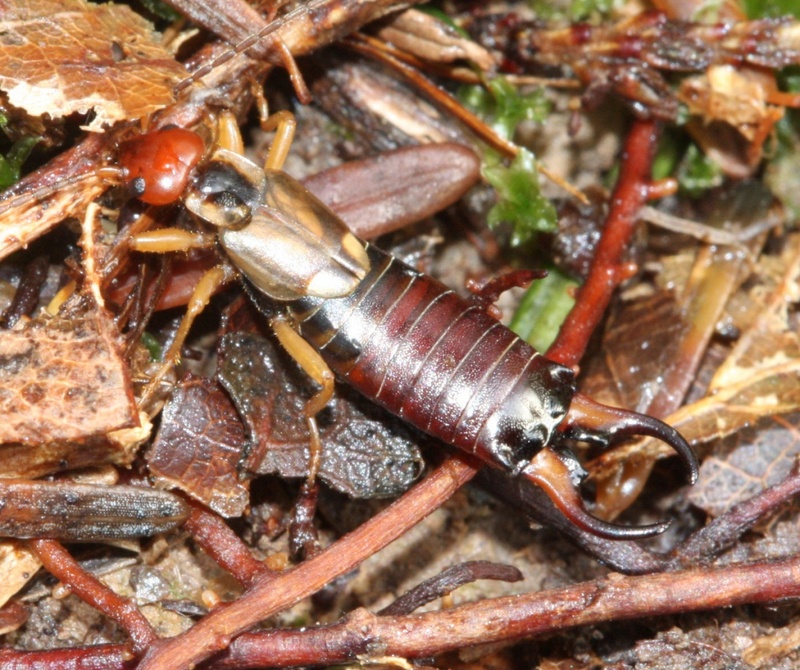 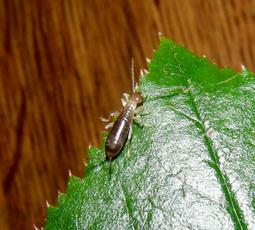 Earwigs undergo a type of development known as incomplete metamorphosis, in which the nymphs progress through a series of moults. 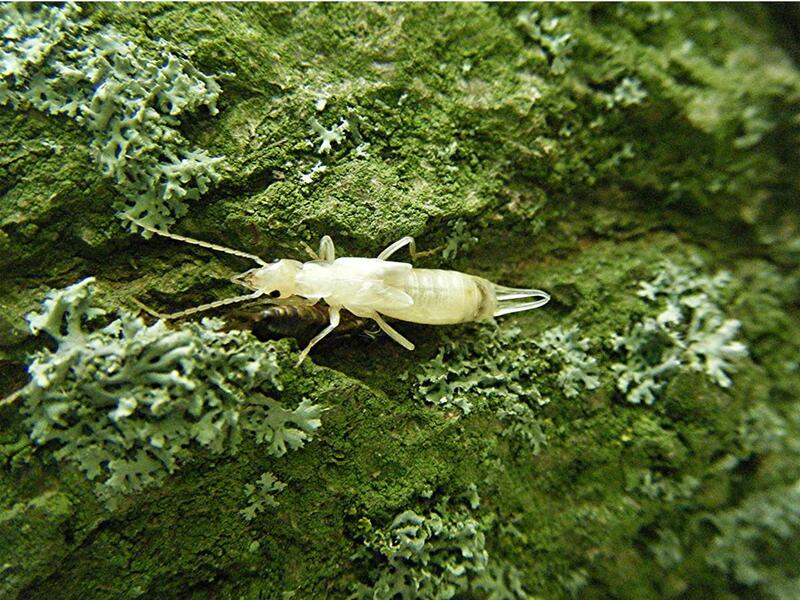 The stages between moults are known as 'instars'. The female will have lost her maternal instinct when the nymphs reach their second instar; if they have not left the nest by this time they risk being eaten by their mother.